In 2015, nearly 40 million Americans lived with a disability. This number represents nearly 12.6 percent of our non-institutionalized population. With so many people living the US with disabilities, our nation has had to rethink how we have structured our public properties. With this in mind, businesses and institutions have to place priority on making their buildings handicap accessible in order to stay in accordance with federal laws. In this blog, we will be discussing how Ready Decks is able to construct and install quality wheelchair ramps for our customers. Schools: Schools are mandated to accommodate all students, whether they are disabled or not. Schools are legally obligated to provide either physical or electrical ramps inside their school. Also, schools must follow the ADA’s strict structural guidelines for bathroom construction. These guidelines ensure that anyone with a disability will be able to use a school bathroom safely. Transportation: Public transportation, which includes, buses, planes, and trains, must have a reserved area for people with handicaps. These areas will typically have more assigned room and will be positioned close to an exit and a support rail. In buses and trains, handicap accessibility features are typically automated and use electric wheelchair ramps for users. Public Places: Public places are classified as areas such as theaters, parks, malls, and so on. All of these areas are mandated, by federal law, to provide reserved handicap seating and ramps (if they are multi-leveled). Private Places, Open to the Public: Private places that are open to the public are areas such as restaurants and stores. Though the property might be owned by a private party, the space is open to the public for use. These areas must have a bathroom and wheelchair acceptable tables. For example, restaurants will typically have a reserved table that is more spacious and allows for free mobility for wheelchairs. Why is the ADA important? The Americans with Disabilities Act is important because it recognizes a group of people that have been mistreated and neglected throughout history. For centuries, the disabled have been considered afterthoughts in society. However, in 1990, the ADA law made it mandatory that all public areas and jobs had to treat all disabled citizens fairly. Discrimination towards one group of people limits their abilities to earn high-paying jobs and even access public areas. Wheelchair ramps, handrails, and even following structural dimension guidelines are all measures that ensure that people with disabilities are able to use public areas just like everyone else. As stated, wheelchair ramps, handrails, and structure dimensions are all methods to ensure that people with disabilities are able to use public areas. For instance, someone with a serious physical disability, such as muscular dystrophy, would have difficulty using things like public buses, bathrooms, or even restaurants, if there weren’t handicap accessibility features in place. Wheelchair ramps are one of the most important disability features because they are useful for most people with physical disabilities. Because of this, most public areas will always have some sort of wheelchair ramp for the disabled to utilize. Of course, every wheelchair ramp that is intended for disability use, must be in accordance with federal guidelines. If you are curious about these guidelines, click here. Many people assume that people with disabilities are grouped into one category, but this could not be farther from the truth. There are many types of disabilities in the United States, all ranging is severity and physical impairment. Genetic disabilities, injury disabilities, and age-related disabilities, are just three of the examples of handicaps. Genetic: Genetic disabilities pertain to any disabilities that you were born with. These disabilities can be mental, as well as physical. For example, physical disabilities, like muscular dystrophy, are genetically inherited and cause lifelong physical disabilities. Injury: Injury disabilities often are caused by an accident or infection that causes physical impairment. One of the most common reasons for a physical injury would be due to military service, an accident, or an infection. Age-Related: Age-related disabilities typically are due to age-related physical issues, such as foot problems, arthritis, cognitive impairment, heart conditions, and much more. At Ready Decks, we have skilled craftsmen ready to build you whatever structure you would like. Though we specialize in patios, decks, and pergolas, we also use our construction skills to build wheelchair ramps for our customers. 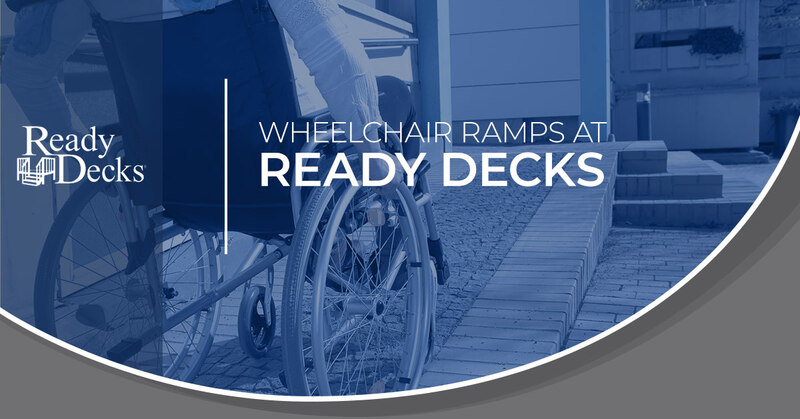 If you are in need of a professional, as well as a federally approved wheelchair ramp, contact Ready Decks today. We can arrive to your location and build your ramp on site! Call us.